Nursery pupils and parents have enjoyed a magical walk into the woods to pick a Christmas tree for their school. 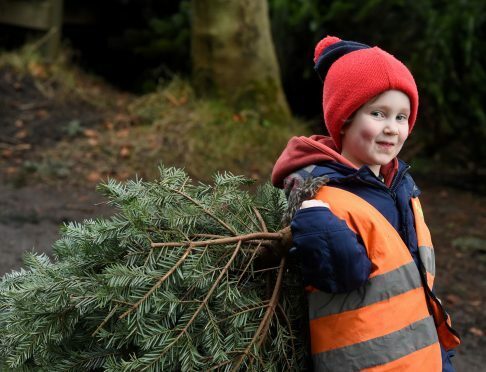 Youngsters from Echt and Broomhill nurseries visited the Forestry Commission festive pop-up shop at Tyrebagger woods and revelled in the short walk through the trees to find one of their own to take away and decorate. Assisted by Mr Chopper-upper and his band of cheery elves, the children were guided through a woodland path to find a suitable evergreen. Forestry Commission Scotland representative and Santa’s little helper, Dan Cadle said this year was already looking like a busy one for the Tyrebagger team. He added: “We are on target to sell another 6,500 trees this year; which I believe is the biggest set-up in Britain. Having attracted the highest number of visitors for any region in Scotland with 1.8 million recorded last year in the north-east, Mr Chopper-upper described these visits as “magical”. He said: “It’s always great to see the children. They’re already beginning to get excited about Christmas and we’re more than happy to help them choose the best tree. Some of the trees have been brought in from other Forestry commission sites, but larger 40ft trees are felled locally. The Tyrebagger Christmas Tree site is open every day from 9am-5pm until December 22.